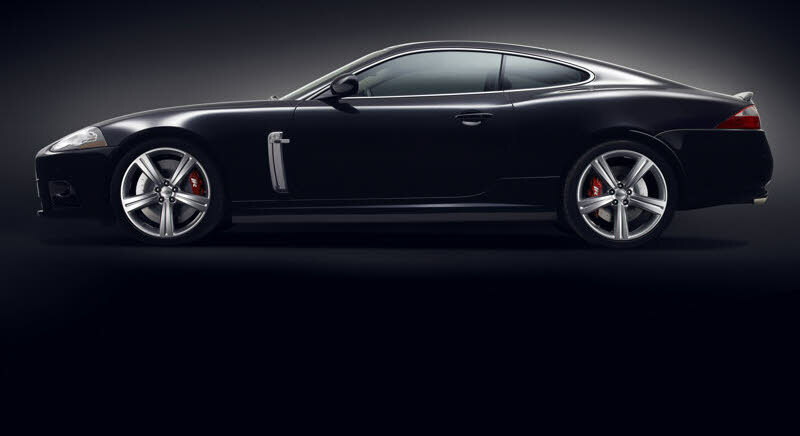 Below are our most popular upgrades for the New XK, Performance, Chassis, Exterior, Interior, the description also contains the relevant information to ascertain if the upgrade is suitable for your model year of car, if you are uncertain or require a part which is not listed then please contact us. Roll over thumbnails for a larger image. Elite RR performance sports rear box, suitable for the new XK/XKR 2006 on 4.2, constructed from 2.5” pipe work in 304 grade stainless steel, huge weight saving over the OE rear box, features quad 3” staggered and slash cut tailpipes with inner perforation, direct replacement for the standard rear box, fantastic sound that gives an Aston V8 Vantage esque bark on acceleration and pleasing rumble at idle, performance increase approx 18-20bhp. Fully mirror polished, lifetime warranty, select from either the XK or the XKR video clips below. Worldwide mail order available. Note. XK will require an XKR lower bumper insert to clear the quad tailpipes. Elite RR performance sports full system, catalysts back, suitable for the new XK/XKR 2006 on, constructed from 2.5” pipe work in 304 grade stainless steel, huge weight saving over the OE system, features quad 3” staggered and slash cut tailpipes with inner perf, direct replacement for the standard exhaust system, fantastic sound and performance increase, approx 30bhp gain. Similar to an Aston Martin Vantage in sound. Video links are coming soon in HD, however sound levels are only slightly increased above that of the rear box options above, a full system is a better choice if further upgrades are planned although not essential due to an inherently good OE centre section design. Modified lower pulley, increasing the supercharger speed by means of a modified crankshaft pulley and oil filter housing to allow for the larger diameter pulley, item must be fitted in house and is suitable for all 4.2 XKR’s. Approx 25-30bhp gain. Lowered suspension, available for all XK & XKR, using progressive rate springs to give a drop of 25mm, offers enhanced looks and sharper road holding & handling, fitting includes full geometry set up. Exclusive fast road/race high performance replacement air filter/s, suitable for both XK & XKR models, constructed to the highest quality from stainless steel and a three layer foam, they offer maximum airflow with maximum filtration and the lowest drop in performance of any filter material as dust and debris inevitably build up, simply clean and refit for maximum performance time & time again. 10-12bhp gain. Note. XKR models require two filters. Prices may fluctuate due to supplier price increases, Jaguar components are most affected and can alter on a monthly basis, for this reason we will always confirm prices at point of order. All goods returned shall be refunded at the discretion of EAPJ. Elite RR performance sports rear box, suitable for the new XK/XKR 2009 on 5.0, constructed from 2.5” pipe work in 304 grade stainless steel, huge weight saving over the OE rear box, features quad 3” staggered and slash cut tailpipes with inner perforation, direct replacement for the standard rear box, fantastic sound that gives an Aston V8 Vantage esque bark on acceleration and pleasing rumble at idle, performance increase approx 18-20bhp. Fully mirror polished, lifetime warranty, Video clips to follow soon. Worldwide mail order available. Elite RR performance sports full system, catalysts back, suitable for the new XK/XKR 2009 5.0 on, constructed from 2.5” pipe work in 304 grade stainless steel, huge weight saving over the OE system, features quad 3” staggered and slash cut tailpipes with inner perf, direct replacement for the standard exhaust system, fantastic sound and performance increase, approx 30bhp gain. Will make an Aston Martin Vantage jealous! Video links are coming soon in HD. Sound is truly awesome! This is something to be heard, like thunder of the gods above if you want everyone to know you’ve got 500+ horses then this will fit the bill!